Savannah, the oldest city in Georgia, has a diverse array of activities and attractions, which makes it a popular destination for all. From the sparkling beaches at Tybee Island to the 22 park-like squares scattered throughout the downtown area, Savannah has a little something for everyone. The historic downtown area features the birthplace of Girls Scouts founder Juliette Gordon Lowe and the Central of Georgia Railway roundhouse complex, which is the oldest existing antebellum rail facility in the country. The Telfair Academy of Arts and Sciences was one of the region's first public museums. One popular avenue is The Riverwalk, which runs along the Savannah River, and is filled with restaurants, bars and small music venues. A popular pastime is to sit on the deck of a local establishment on a warm spring day and watch the boats roll up and down the water. Among the most famous Savannah destinations these days is The Lady and Sons restaurant, owned and operated by cook and entertainer Paula Deen. Get there early or be prepared to wait. Who knows? You might even see Paula. Another Savannah tradition is the annual St. Patrick's Day Parade, the second-largest annual celebration and parade in the country. Green beer flows freely throughout the parade route and visitors come from throughout the region to experience the event. Golfers have plenty of options to choose from in the Savannah area, too, including The Club at Savannah Harbor, which hosts the annual Liberty Mutual Legends of Golf on the Champions Tour. Designed by Bob Cupp and Sam Snead, this is the place to go if you'll only have one opportunity to play during your visit. Wilmington Island is one of the oldest facilities in the area. Designed by Donald Ross and opened in 1927, it requires players to deal with four lakes and a pair of streams. Wilmington Island hosts one of the state's top invitational tournaments each spring. Other golf options in town include Bacon Park, an inexpensive facility that features three nine-hole layouts, and the nine-hole Mary Calder Golf Club, which opened in 1937. 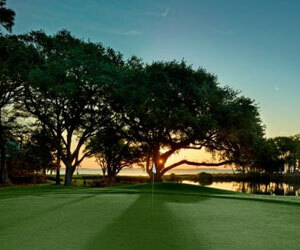 The Landings is a planned community on Skidaway Island with six private courses, including the Tom Fazio-designed Deer Creek layout, which received a $7 million makeover in 2010 and has hosted the Georgia Amateur. Golfers can play every month in Savannah, although the summer months can be hot and very, very humid. Lost Plantation Golf Club in the bedroom community of Rincon, some 30 minutes from Savannah, is a sassy course that challenges with numerous huge bunkers around the green, and disappearing fairways. This is not a cakewalk golf course. It does have some cakewalk holes, though, for variety - and to get one's stress back to reasonable levels. Lost Plantation Golf Club is a homeowners course that also welcomes the public. It's a relaxing course with enough challenges to keep it interesting, round after round - all at a great price. Afterward, hang out on the deck with some new-found friends. The Landings is a residential golf community 15 minutes from the heart of Savannah, on a heavily-treed island called Skidaway. It has six golf courses and a little less than 2,000 golf memberships. About 3,500 island residents play the game. Called the "Hostess City of the South," Savannah brings with it the image of lovely girls in white dresses having a sweet iced tea. And like most key cities in the South, Savannah is a place to play golf, with nearly 20 courses in a city of just 130,000. Courses range from the mammoth and extravagant to smaller and more discrete. Crossing the magnificent Savannah River Bridge towards South Carolina, experienced drivers turn their gaze to the right. Looking east affords a glimpse of the leafy and flourishing downtown, while looking west provides a landscape of industrial blight. Now there's another compelling reason to fix your eye on the east. It's the Club at Savannah Harbor, a sterling Bob Cupp and Sam Snead co-design located on a spit of land on the Savannah River called Hutchinson Island.